Mysore Masala Dosa ~ an absolutely addictive, comforting fare and a classic among South Indian breakfast recipes. I always look forward to my visits down South to savor the flavor of this Karnataka special dosa that has its origins in Mysore. One thing I noticed during my visit to Mysore and Bangalore is that each restaurant has its own version of Masala Dosa, be it Benne Masale, Mysore Masale or Plain Dosa. 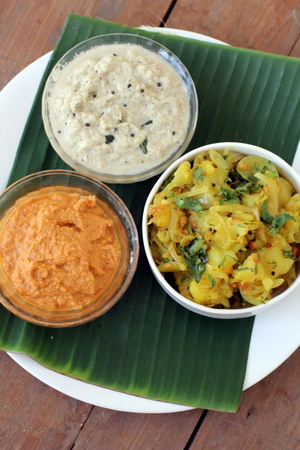 Either the accompaniments served with dosa were different or the stuffings and texture of dosa differed. Dosas are thin and crisp or have a crisp exterior with a spongy uttapam like interior. 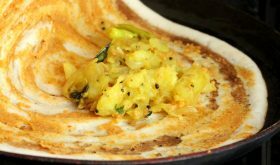 Dosas are liberally sprinkled with podi, drizzled with ghee/butter and served with potato masala, sambar and a colorful array of chutneys or plain sponge dosas similar to set dosas are served with vegetable saagu and green chutney. Mysore Masala Dosa recipe is easy to make though it is a labour intensive breakfast dish. This addictive rich dosa has a crisp exterior and the spongy interior is liberally smeared with butter or ghee, over which a layer of red chutney is smothered and finished off with potato masala, folded in half and served with accompaniments like sambar and coconut chutney. Its rich and filling, enough to see your through the day. And the best way to finish off this ultimate South Indian breakfast indulgence is a cup of strong filter coffee. To make the dosa batter, soak rice, parboiled rice, urad dal, chana dal, tur dal and methi seeds in a large bowl with enough water for 6-7 hours. Soak the poha or flattened rice in one third cup of water for at least half an hour before grinding the dosa batter. Drain the water from the soaked rice-dal mixture and grind along with soaked poha, in batches, adding little water while grinding. It should be a smooth paste, neither too thick or runny. Add enough water to make a smooth batter. Add a tsp of sugar and mix well. Ferment the dosa batter overnight or at least 8-10 hours. It will rise on fermentation. At the time of preparing dosas, add salt to taste to the dosa batter and mix well. To make potato masala, heat oil in a heavy bottomed vessel. Once the oil is hot, add mustard seeds and as they begin to splutter, add urad dal and allow the dal to turn red. Add curry leaves, green chilies and ginger and mix for a few seconds. Add the sliced onions and saute for 6 mts on low to medium flame. Add the turmeric powder and mix. Add the boiled potato cubes and mix well. Lightly crush a few potato cubes with a ladle. Sprinkle1/4 cup of water, place lid and cook for 5-6 mts on low flame. Remove lid and mix well. Adjust salt, add lemon juce and coriander leaves and mix. Turn off flame and remove to a bowl. To make red chutney, heat a small pan and dry roast the red chilis for 3 mts on low flame. Remove. If using garlic, saute garlic in a little oil till lightly red and remove. Grind the roasted red chilies, roasted garlic, dalia (roasted gram dal), onion pieces, grated coconut, tamarind, sugar and salt to a fine paste. Remove to a bowl, add a tsp of oil and mix well. Drizzle oil along the edges of the dosa, drizzle melted butter or ghee all over the dosa. Cook the dosa on medium flame till the base begins to brown. Just before removing the dosa, smear a heaped tsp of red chutney all over the dosa. Place a ladle full of potato masala on one half side of the dosa, fold the dosa over the potato filling and remove to a serving plate. Prepare dosas with rest of the dosa batter. 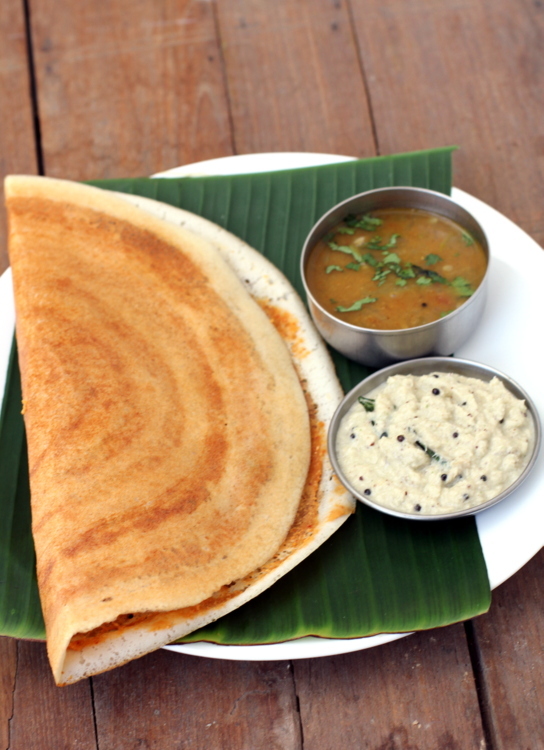 Serve Mysore masala dosa warm with sambar and coconut chutney. If you do not have par boiled rice, replace it with raw rice. Do not use long grained rice to make dosa batter. Short grained sona masuri type rice will do. For red chutney, garlic can be ground raw with the rest of the ingredients. I like to saute garlic till red and then grind it. Those who do not like the flavor of garlic, can omit it and follow rest of the procedure to make red chutney. The recipe for red chutney is of medium spice. You can reduce the quantity of red chilies for a milder spice. To attain a deep red color for the red chutney, use Kashmiri chilies. I ran out of Kashmiri chilies and used local produce red chilies. Left over dosa batter can be refrigerated upto 2-3 days after which it will turn sour. Prepare uttappam with left over 3 day old dosa batter. By Sailu Published: June 30, 2013 Mysore Masala Dosa recipe is a classic among South Indian breakfast recipes. 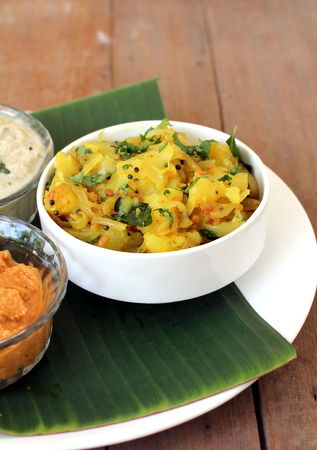 Red chutney or podi is spread on the dosa, served with potato masala & chutney. I have bought an Ultra grinder.I find the batter becomeswatery as we have to use more water for grinding.Please advise how to gind using Ultra.Mysore Masala dosa looks lovely.Thank you. Geeta, am afraid I cannot answer your question regarding Ultra grinder. Readers, please try to answer Geeta’s query. Thanks. When using wet grinders, do not add any extra water, the soaked ingredients already have enough moisture in them to be grinded. However, check from time to time the batter, add in small quantities and check for consistency. I must warn you that the above quantity in grinder becomes huge as the ingridents are grinded and not cut like a mixie. It gives however much more flavour, richness and does not gas unlike Mixie where due to heat the batter takes another turn. I have an ultra grinder myself and always add plenty of water while grinding my batter. This is how I do it. I first add the urad dal handful by handful and when the grinder starts struggling to move, add water. Once the urad dal is perfectly soft and fluffy, remove to a container and then add rice. Same rule for adding water. I grind rice smoothly also and find that this is the most optimal for making idlis and dosas with the same batter. At the very end, I combine both and give them a few minutes in the grinder. My mom’s rule for the perfect idli/dosa batter is to check if the batter flows through your fingers when you pick it up with your fingers. 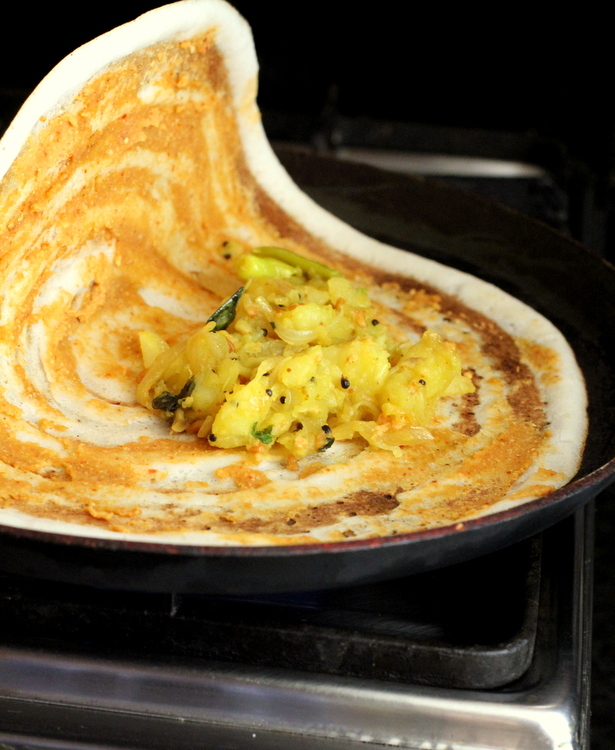 If your batter is a tad thick for dosas, you can always add water right before making it. However, the same won’t work for idlis. When you add water right before making idli, your idlis turn out flat. This is why it’s important to have the right proportion of water when you grind a big batch, which is what I usually end up doing. this was one recipe which i was searching since long. You got the description right… crispy on the outside and soft on the inside – exactly what i felt when i ate this dosa in bangalore. Hope you could just mention a little about how you got this recipe..?? various websites have various proportions and ingredients… just was curious as to how authentic this recipe is…!! After numerous trials among family and friends, this recipe for the dosa batter was close to what I relished during my travels. The trials continue. I cannot claim its an authentic recipe by any means. Even the red chutney recipe is one of trial and error. If I haven’t thanked you before I really should do so now (and if I have, I’ll thank again): without your Indian recipes (and expert advice), our meals would be dull and bland. Thank you! I use a mixer and not a wet grinder. The above mentioned proportions were ground in three batches in a mixer. For some reason i am not able to see the ingredients for this recipe. Sorry for the inconvenience caused. The issue has been resolved and you should be able to view the recipes. Can’t view the ingredients list and recipe. Not sure if this is a browser problem, but I tried on Chrome, Firefox and IE. Site was facing technical issues due to high traffic. The issue has been resolved and you should be able to view the recipes. Sorry for the inconvenience caused. Sailu – unable to see the recipe.. Am I the only one having this problem? The technical issue has been resolved and you should be able to view the recipes. Sorry for the inconvenience caused. What is your cup measure ? Is it 250ml(US standard) or 160ml like it’s used in India ? The photos are beautiful, I wish I could hop on a plain. Thank you for sharing. Can I use the same potato filling for rawa dosa as well? Hi, can you please tell why is Urad Daal so necessary for crip dosa recipes, Can I make paper dosa with just fermented rice batter?? Whats the role of black lentil?? Can I use idli rice instead of raw rice ? I would use raw rice.